I’m happy to bring you the good news that the State Museum is getting set to launch a statewide 1812 web site that I hope can serve all of us. For starters, we’re looking to use the site as a clearinghouse of information for all 1812 related events across New York State and with our partners in Canada. So we’d like to include links to your individual website and a calendar page on which you can submit 1812-related events. In order to get this part of the website ready for launch, we’re asking that you submit information about your planned events to us at 1812@mail.nysed.gov. Beyond that, however, when the site goes live, users will be able to navigate an interactive timeline of events, read about prominent New Yorkers from the War of 1812, and view selected artifacts from the New York State Museum’s historical collections. This will by no means mark the end of our efforts. 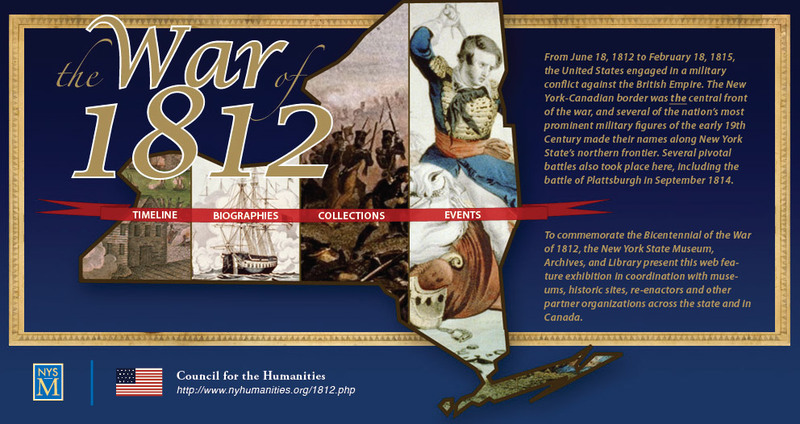 The national and statewide events highlighted on the initial launch, rather, will supply a framework within which we can work with you and all our partners to highlight New York’s War of 1812 stories and biographies down to the local level. In other words, we’ll be asking you to submit additional timeline entries, biographical sketches, and objects from your collections (or others in your areas). The website will thus belong to all of us and serve as a growing and evolving statewide resource for the duration of the bicentennial commemorations. Details will be forthcoming, but for now, please get back to us with information about your planned events. And don’t hesitate to ask questions or make suggestions by responding to the address listed above.